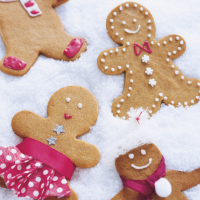 This recipe for gingerbread can be used to make a whole range of decorations, gifts and, of course, gingerbread people. Get the children to help roll and cut out the dough, and to decorate the biscuits. Turn out onto a lightly floured surface and roll to a thickness of about 5mm. Dip biscuit cutters into flour before cutting the dough, or cut around templates, which you can find at waitrose.com/christmas. Place the shapes onto the lined baking trays and bake, in batches, for 9-10 minutes until light golden brown. Remove from the oven. While still warm, and using a skewer or chopstick, make any holes that you will need to hang up the biscuits with ribbon or to make a yuletide garland. If you are decorating your Christmas cake with gingerbread people, make the holes in their arms so that ribbon can be threaded through at a later stage.